We've paid scant attention to the historic charms of New Jersey's largest city, Newark, and that's something we need to remedy. Founded in 1666, it's rife with all kinds of great hidden history, which hit us like a brick when we visited Military Park at the intersection of Broad Street, Park Place and Raymond Boulevard. The tip of the property has to hold the state record for density of brass plaques. I saw four without even really trying. Unlike the Liberty Pole erected in Englewood, the first Newark version seems a bit, well... late. Waiting to put one up until the war was won is a bit like, well, becoming a Giants fan after this year's Super Bowl. My guess is that patriotic post-Revolutionary Newarkers were caught up in the spirit of independence and wanted a traditional symbol to represent their feelings. The date of the first pole placement is telling: July 3, 1793, the eve of the 17th anniversary of the signing of the Declaration of Independence. 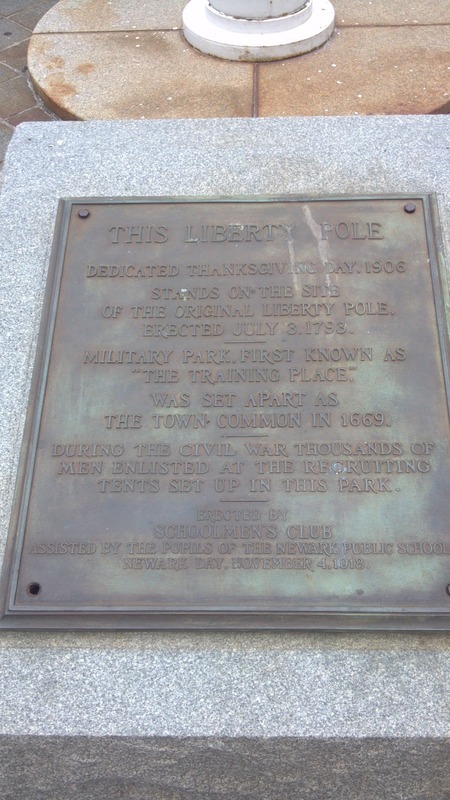 According to my research, the pole was a centerpiece for the community's July 4 celebration, topped by a red cap of liberty. The day started with the firing of cannons on either side of the pole (the same as those flanking it today? I don't know. ), and the parade that followed was headed by another liberty cap. By that time in American history, partisan politics were already seeping into government, and the Newark celebration was one of many that seem to have been politically motivated. George Washington had begun his second term as president just a few months before, and many were unhappy with his Federalist tendencies. Raising the liberty pole and cap was a way for those with more Republican-Democratic views to express their preferences, absent a truly organized set of political parties. I guess you could say that the Fourth of July party was as organized as they got, and it's likely that many Newarkers just wanted to use the pole as a rallying point for revelry. An internet search reveals no specific reason for the timing of a replacement to the pole in 1906, so your guess is as good as mine on that. The Thanksgiving date loosely correlates to Evacuation Day in New York City, which commemorates the day the British left for good after occupying the city for much of the Revolutionary War. The Manhattan Liberty Pole was the focus of revelry there, but that tradition had largely gone by the wayside in the late 1800s. Newark's hidden-in-plain-sight Liberty Pole leads me to wonder if other New Jersey communities are sheltering similar poles, perhaps unknowingly. Anyone have a lead for us? Neat. I'd guess that the timing may also have had to do with the fact that 1793 marked the tenth anniversary of the Treaty of Paris. That's a good point, Rick. I hadn't thought of that possibility, but it makes a lot of sense.